OK, be prepared because this is a real story that happened to me. When I see a Sphynx cat I see art. I know that many of you disagree with me but we all see things differently, right? So, I am the proud owner of two gorgeous Sphynx cats, Odessa and Joey, and one day, at the early stages of my new relationship with them, this happened to me. I was leaving home a little later than usual in the morning because I had a meeting before going to work. How lovely it is to have a little bit of extra time in the morning! While checking I had everything ready, I called the cats to make sure they were ok and to give them an extra bite before I left but Joey, the male cat, didn’t come, when usually he is the first in line when I call from the kitchen. He wasn’t in any of his usual places so I opened all the cupboards and wardrobes to check that he wasn't stuck in, but nothing. As I had been out in the garden I thought that he may have escaped without me realising. Fear, panic and sadness suddenly hit me and I run out into the street trying to find my cat. Of course, it was raining, and in the pouring rain I went out calling him, crying, jumping fences… then I went to the front of the house and started calling him, but nothing. I also stopped a few people, in floods of tears by now, asking if they had seen a pink cat. The answers were rather short and cold: "no, I am afraid not"; “Mmm, no”; “Sorry”. Not a sign of sympathy from anyone! Forty minutes later and of course late for my meeting, I went back home, all wet, still crying...only then I realised that there was a pink blanket on the sofa and Joey was "purrrring" under it! Sphynxes are sociable, playful and loving. A recent study in the Journal of Veterinary Behavior ranked Sphynxes as the most affectionate cat breed. 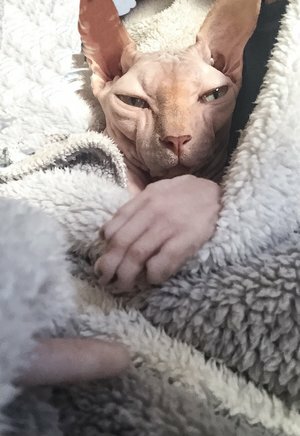 Sphynxes aren't hairless - they actually have a very short fur. And...if you have pink in your interiors, don't buy a pink cat!